Aspiring to keep 1st place CSKA (21-4) spent the last match of the regular season. «Astana» (14-8) approached the game ranked 5th in VTB standings. The club from Nur-Sultan showed strong performance all the way until halfway of the second quarter, when Will Clayburn scored 5 points in a row in less than 30 seconds, and Kyle Hines player who cameback from the suspension(37:27) secured CSKA powerful push. The army club, which played a wide rotation, had an advantage in the rebounds (22-16) and less often was mistaken (3-6). At the break, the rivals left with the score 45:34 in favour of CSKA. 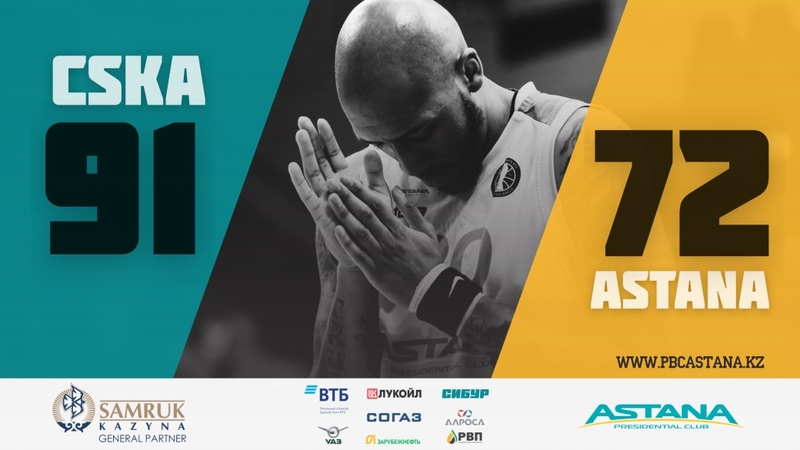 In the second half, “Astana” several times managed to cut it to the single digit (49:58, 54:63, 57:65), but CSKA did not allow the opponent to do more. At the start of the fourth quarter, Nikita Kurbanov’s baskets returned the double-digit advantage to the home-team (70:57), after which they confidently brought the matter to victory. CSKA Moscow, with the result of 22-4 completed the regular season in 1st place, but in case of equality of wins with UNICS (18-4), Kazan will be on the top by additional indicators. CSKA: Kyle Hines (18), Daniel Hackett (16), Nikita Kurbanov (13 + 5 rebounds). «Astana»: JJ O'Brien (25), Jeffrey Grossell (12 + 7 rebounds), Anthony Clemmons (10 + 6 assists). - First, congratulations to the team, we took the game seriously and this proves the result. We were better today, controlled the match and deserved the victory. We spent four games in eight days, including one away game, and achieved one hundred percent result, and evenly distributed game time, each player contributed. Today, Nikita Kurbanov spent the most on the floor — 24 minutes, and in general in previous matches no player played for more than 24-25 minutes. Now we start preparing for the playoffs. I want to thank the fans who supported us today and wish good luck to ”Astana”, which is deservedly a play-off team. - Congratulations to CSKA — it is a well-deserved victory. Our rival showed his class and athleticism — we lost most of the duels, and a short rotation did not help us in this. But no disaster happened. The next three matches will be important. We will have strong rivals – “Lokomotiv”and “Enisey”at home, and “Zenit” is away, we will need to show all our skills. The next matches of the capital basketball players will hold on their floor against «Lokomotiv Kuban» on April 15 and «Enisey» on April 21.. These will be the final home games of “Astana” within the regular season of the VTB United League.